Amy Wright and her grade-school-crush-turned-husband have an amazing love story. They have six kids from tween to toddler, as well as one long-term exchange student who is 16. Amy grew up as an only child of divorced parents. Her dad suffered from addiction, and her mom worked long hours to provide for her daughter. Though she lacked a model for how to be a good wife and care for a home, God is using those challenges for Amy’s good and has given her a passion to encourage other women in their journey of becoming the mother God made them to be. IF GUILT OR SHAME HAS EVER KEPT YOU FROM THE PURSUIT OF YOUR DREAM, THIS WAS THE EPISODE FOR YOU. In this episode, Amy talks openly about the shame she has battled in her dream to write and encourage other moms on their journey through her blog, The Big Family Home. Our conversation is a reminder that God doesn’t want us to live in shame or guilt. We are called, instead, to live in freedom; it is for freedom that Christ has set you free (Galatians 5:1). 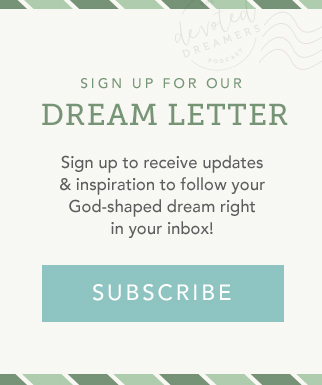 Hear why it’s so important to remember you’re not alone in the challenges related to your God-shaped dream and that the struggle itself doesn’t define you. 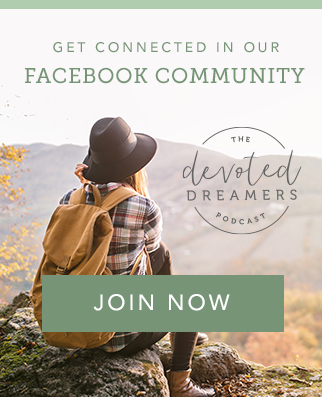 God meets you there, frees you up, and if you’ll let us, we’ve got a tribe of listeners and dreamers over on Facebook who would love to cheer you on as you take scary step after scary step toward what the Lord has prepared in advance for you.